The essence of the SWP/UAF position towards the EDL is that it is a fascist movement; but not obviously so. This is the argument they applied to the BNP as well. They have applied it to all sorts of other right-wing groups over the years. But this position stretches wider than that. The SWP, in the 1980s, believed that the Conservative Party, under Thatcher, was essentially fascist and, today, Chomsky believes that the American state needs to be ‘de-Nazified’. Kitchen goes on to say that these groups ‘will probably be more restrained and civilised’. However, and this is what the SWP/UAF is all too keen to stress, the EDL is ‘no less menacing’ without the blatant aggro and violence of the old-style Nazis and fascists. That is, even without a riot or large degrees of violence, an EDL march in Leicester or Luton is still ‘menacing’. There is a problem here. On one hand, UAF/SWP accuses the EDL of being ‘thugs’ and ‘bigots’. On the other hand, as with the BNP, they says that it is ‘not as rowdy’ as traditional fascist groups. The EDL is ‘more concerned to appear respectable’ at the same time as being ‘full of football hooligans’. So the EDL is both openly violent and aggressive, as well as attempting to disguise its intrinsic racism and violence. When the EDL is violent, the UAF says: See! I told you so. When it is ‘respectable’, they say: Do not be fooled by this. So, in other words, the EDL cannot win. Kitchen also says that neo-fascist groups disguise or hide their anti-Semitism. That is, although anti-Semitism ‘is often present’, it is nevertheless ‘less pronounced’ than, say, with the German Nazi party or even the UK’s National Front in the 1970s. Here again the EDL cannot win. The SWP/UAF, as well as the many Muslims and Islamists it has ‘enabled’, have criticised the EDL for its strong ‘Zionist’ and pro-Jewish stance. That pro-Zionism, too, ties in with fascism in that Zionism is ‘both racist and fascist’ to the Trotskyist and the Islamist. 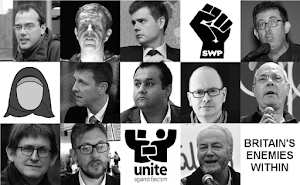 However, UAF/SWP, but especially Searchlight, have been keen to stress the EDL’s ‘real anti-Semitism’ and the fact that this ties them in with groups like the BNP and Combat 18. Nick Lowles has also written about the anti-Semitism of various people both in the EDL and with connections to it. So, again, the EDL is both shamefully ‘Zionist’ as well as being secretly anti-Semitic. Another facet of neo-fascism, again according to Kitchen, is that it targets immigrants and ‘blames them for economic problems such as unemployment’. This is a strange one. The EDL is a single-issue group. That issue is the fight against radical Islam, Islamism, Sharia law and so on. 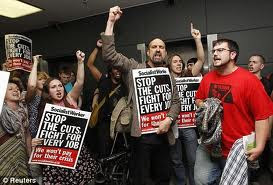 The EDL has no position on unemployment or on any other political or economic issue. There is not a single official publication or website article by the EDL that even mentions immigrants as a whole, never mind blames them for unemployment or whatever. Of course some EDL may be against immigration - at least unrestricted or mass immigration. Indeed I would say many EDL are against mass immigration and the wiping out of ‘hideously white areas’ (the Guardian). However, this is far from being EDL policy, as such. This is where Marxist theory steps in. Even though the EDL has no official position on immigration (except, of course, Islamoterrorist, radical Muslim, etc. immigrants), the EDL’s position on Islamism, mosques, etc. has to be viewed through the distorting lens of some kind of Marxist theory. Marxism is an materialist theory which basically states that ideology, or ideas, opinions, etc. are determined by material reality - specifically, by ‘socio-economic reality’. Thus the UK’s socio-economic reality is seen to determine the EDL’s position on Islam, mosques, etc. More specifically, unemployment, low wages, insecurity, etc. are supposed to determine the EDL member’s - and the whole EDL's - views on Islamism, etc. Let’s put this in a way that Marxists don’t tend to put it - simply. EDL members are turning against Islam, Muslims, etc. because of unemployment and other socio-economic problems. Even more simply. People are joining the EDL’s campaign against ‘all Muslims’ because they are unemployed, on low wages, ‘exploited’ at work, and whatnot. They do not join the EDL’s campaign because they don't want Sharia law in the UK, or because they find Islam reactionary, sexist, anti-Semitic, and-gay, etc. To think that it is to be an ‘idealist’ or a ‘bourgeois theorist’. What the EDL thinks and feels does not matter. What matters, to the SWP/UAF, is the socio-economic reality which is seen to determine, casually, what the EDL and its members think and feel. But surely fascism is about state power. What has the EDL, a grass roots, single-issue movement, got to do with state power? The EDL is not even a political party, as such. Unless the state, whatever form it takes at a moment of ‘crisis’, simply employs the EDL, as it were, to do its dirty work. Whatever the truth of the SWP/UAF’s position on the EDL, you can be damn sure that reality/fact will have to accommodate itself in order to fit comfortably within the theories this Trotskyist group sees the world through.